Traditional toilet seats use a fast closing mechanism. It hits the toilet bowl with force and creates noise which is at a time annoying and responsible for decreasing the lifetime of your toilet bowl. Soft close toilet seats deserve thanks for bringing a solution to this problem. It really feels embarrassing when a loud sound is created during closing the lid of the toilet seat. Moreover, you do not have to be worried about your kids of being hit their little fingers because of accidentally slamming down of the toilet seat. Moreover, soft closing toilet seats are easier to clean and more sanitary since they do not require as much handling as traditional toilet seats. So, people are tending to replace their toilet seat with soft close one nowadays. 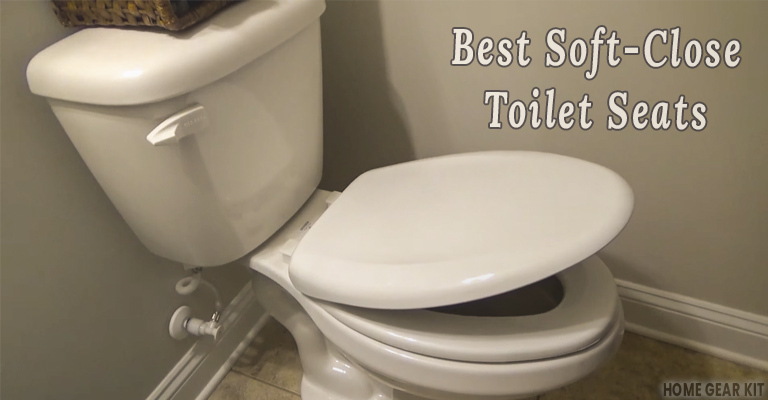 If you are unaware about soft close toilet seats, let me introduce you with them first. What are Soft Close Toilet Seats? Toilet seats that are designed to lower the seat and lead quietly without making any noise are called soft close toilet seat. They require very little maintenance, only a little adjustment from time to time is enough for such toilet seats. TOTO SS154#01 Traditional Soft Close Elongated Toilet Seat is a premium quality toilet seat available in the market. It is ranked at the top position of the list because of its latest innovative smart seat technology in a classic design. The solid, high impact plastic has made this toilet seat a durable product. The built-in soft close hinge system lowers the seat down to the bowl gently without making any slamming sound. Its ergonomic design gives you a comfortable experience of toilet usage. It is designed to fit with any standard elongated toilet bowl. You can install it easily. The manufacturers provide mounting and connection hardware with the product. So, you do not have to spend any extra money to buy the installation products. Its outer part is finished with Polypropylene that adds extra shine and glossiness to the product. It also shows good resistance to chemicals and cleaning agents. You just have to clean it and the toilet seat will look new for a long time. If you have kids and you do not want to get worried about any unwanted accident, buying TOTO SS154#01 Traditional Soft Close Elongated Toilet Seat for your toilet bowl will be the wisest decision. Mayfair is a renowned brand in the market of toilet accessories who manufactures innovative and stylish toilet seats for over 60 years. Mayfair Molded Wood Slow Close Toilet Seat is engineered with whisper close technology that has been eliminated the annoying noise of slumming shut off the toilet seat. It completely eliminates the possibility of finger-pinching. It is designed with the latest STA-TITE Seat Fastening System. So, you do not have to be bothered about the movement of your toilet seat anymore. It provides great service for a long time and if you need to change the hinges, you can also change it quickly and easily at any time. It is elongated in shape and so it fits perfectly with any standard elongated shaped toilet bowl, especially of the USA and Canada. Mild soap and water are enough to clean this toilet seat. For the convenience of cleaning, you can separate the lid from the seat also. Its aesthetic beauty is eye-catching and its color blends with your bathroom finely if your bathroom is white in color. Its price is reasonable. Those who are looking for soft close toilet seats of good quality at a reasonable price Mayfair Molded Wood Slow Close Toilet Seat is a better option for them. Bath Royale MasterSuite Round Toilet Seat is one of the best soft close toilet seats that have been manufactured using advanced material and latest technology. Eurocast is the building material of Bath Royale’s toilet seat which is the secret of its long life. It is heavier, harder and stiffer compared to most of the plastics used for manufacturing toilet seats. People who are obese can choose this toilet seat with confidence. It shows high resistance against scratch, stains and chemical attacks. It is designed to fit all round toilet bowls such as Kohler, American Standard, Toto, Crane, Eljer, Caroma, etc. Lifting and lowering this toilet seat is very easy. Moreover, you do not have to bend to lower the seat and so, it is an ideal toilet seat for people with lower back pain. They are non-absorbent and easy to clean. Their solid color does not fade with time and looks like a new product for a long time. The mounting hardware of Bath Royale’s MasterSuite Round Toilet Seat is made of stainless steel and so they are strong but, there is no possibility of getting rusted. Compared to the quality and features price of MasterSuite Round Toilet Seat is very reasonable. Once you use this product you will not like any other product except the Both Royale brand for next purchase. KOHLER K-4636-0 Cachet Elongated White Toilet Seat is specially designed with subtle styling and innovative technology. The ergonomically contoured seat provides the highest comfort to its user while using. Solid polypropylene has been used as the building material of this toilet seat. It shows good resistance against staining, fading, and chipping. Though the described toilet seat is designed to fit elongated toilet bowl, it is also available to fit with round shaped toilet bowl also. KOHLER has been used Quiet-Close technology in this product to turn it into a perfect soft close toilet seat. It can also bear the high load and so you do not be worried if you are overweight. The hinges are made of strong plastic and the color of the hinges matches with the color of the toilet seat. Since hinges have quick release property they let the users remove the seat for perfect cleaning and you will be happy to know that you do not need any additional tools for cleaning. The hardware of this toilet seat is engineered to install easily within a short time. To prevent the seat from shifting and to ensure its stability it has grip-tight bumpers. All the installation hardware is provided with the product. You can install it without any trouble and by spending a little time. American Standard 5325.010.020 Champion Slow Close Elongated Toilet Seat is a popular example of a shiny and eye-catching toilet seat that is enough to bring a luxurious look in your bathroom. Its unique slow close mechanism helps you to stop embarrassing noise of slamming of your toilet seat. And, for children, it makes a safe toilet environment. It has lift-off hinges so that you can remove the seat without any hassle to clean it properly. After cleaning you can attach it again without taking the help of any other tool. It is made of strong plastic called duroplast. Duroplast looks like chinaware, i.e. ceramic. Designers have designed this toilet seat to match with various bathroom decors in a great way. It is a product of great quality that prevents any kind of leaking, reduces installation time, saves water, and adds durability. America Standard is producing toilet seats for a long time with a reputation that you can depend on them without thinking twice. To make your toilet a luxurious one you will hardly find a second better option than American Standard 5325.010.020 Champion Slow Close Elongated Toilet Seat at a comparatively low price. How Does Soft Close Toilet Seat Work? The mechanism of soft close toilet seat lies in its special slow close hinge system. The hinge lessens the motion of toilet seat during closing with the aid of a tiny air cylinder or spring. The lid falls on the toilet seat at a smooth and controlled motion as you start to tap the seat and lower it down on the rim of the toilet and no noise is created. Q. How can I adjust my soft close toilet seat? Take a screwdriver and loosen the screws of your soft close toilet seat. Now you can adjust it to the right position by adjusting the hinges of the seat. Q. How can I understand which shape of toilet seat do I need? At first, you have to determine the shape of your toilet bowl and depending on its shape you have to choose the toilet seat; if your toilet seat is round or elongated you have to choose round or elongated shaped toilet seat respectively. Q. How can I determine the shape of my toilet seat? By measuring the distance between the centers of the bolt holes out to the front rim of your toilet you can determine the shape of your toilet seat. If the distance is approximately 16 1/2″ you have to consider your toilet seat as round shaped. And, if it is approximately 18 1/2″, its shape is elongated. Q. If my soft close toilet seat does not work how can I fix it? Sometimes, soft close toilet seats shut at a fast speed because particles lodged in and around the moving parts of the hinges over time. Most of the cases, a thorough cleaning is enough to resolve this kind of problems. Q. When should I replace the hinges? As long as you notice no cracks or pieces in the hinges you can use it. But if you notice any crack or broken piece you have to replace it. Soft close toilet seats have so many advantages. And the most significant two are already described that is – no slamming and no possibility of accidents. It is more sanitary compared to traditional toilet seats as they require very little touching for handling purpose. Its popularity is increasing day by day and that day is not so far when there will be no toilet seats except soft close toilet seats.